The Meditech EDM is designed for the ED, but it does integrate with other Meditech modules and can be viewed from the EHR. From many screens within the EDM, the Panel Menu will be available. My List is an interactive list of all the patients under the current users care. When the EDM Tracker button is selected, the Unassigned Patients screen displays. 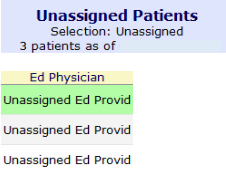 Unassigned Patients is a list of all patients in the ED that a provider has not yet signed up for. This is designated by the Unassigned ED Provider/designated Temporary Provider in the Ed Physician column on the list. Users can sign up for available unassigned patients, or proceed to other tasks by using the panel buttons. To sign up for a patient, click the patient’s name and select the Sign Up button from the panel. The current user’s name will now display in the Ed Physician column. Once the Unassigned Patients list is refreshed, the selected patient will no longer display. To initiate care for the selected patient, click Lists from the panel and choose My List. This page was last modified on 24 February 2016, at 07:49.